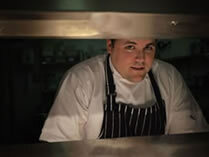 On Monday the 5th of December 2011 Masterchef Finalist Tom Whitaker cooks and hosts a special dinner with Wesley Smalley, Executive Chef at Charlotte's Bistro. The event starts at 7pm with Canapés and award winning Nyetimber English Sparkling Wine served on arrival followed by a sit down three course set menu celebrating seasonality, quality local produce and modern British cooking at its best. Both Wesley and Tom will be up in the dining room after dinner to talk about food, cooking and anything else that springs to mind! The event is intended to be a social occasion as well as an opportunity to enjoy a fantastic collaboration between two talented young British chefs. Charlotte's Bistro owner Alex Wrethman will be looking after you on the evening with Matthew Mawtus, Charlotte's new Operations Director and resident wine expert. A wine pairing option will be available on the evening at an additional £18 per person. Menu price above does not include any further drinks/wine or discretionary 12.5% service charge. Ticket price will be deducted from the total bill on the evening.